The Gram-positive eubacterium Streptomyces coelicolor A3(2) is considered a model soil bacterium, with a complex life cycle involving mycelium growth and spore formation. An interesting feature of S. coelicolor is its capacity to produce useful pharmaceuticals - anti-tumor agents, immunosuppressants and a variety of antibiotics, including the tripyrrole undecylprodigiosin (Red), calcium-dependent lipopeptide (CDA) and the polyketide actinorhodin (Act). These compounds are usually produced during the morphological transition that initiates spore formation. Genes involved in antibiotic synthesis are mostly clustered on the S. coelicolor genome, and antibiotic synthesis involves a reasonably large number of genes, the expression of which is controlled by complex regulatory mechanisms. The availability of the S. coelicolor A3(2) genome sequence and a set of mutants enabled Huang et al. to carry out a global DNA-microarray-based analysis of gene expression during growth and antibiotic synthesis. Growth of S. coelicolor cultures is typically characterized by four stages (see Figure 1): an initial rapid growth phase, starting approximately 14 hours after inoculation; a transition phase of approximately 2 to 3 hours, starting 18.5 hours after inoculation; a second rapid growth phase lasting for approximately 5 hours; followed by a stationary phase. 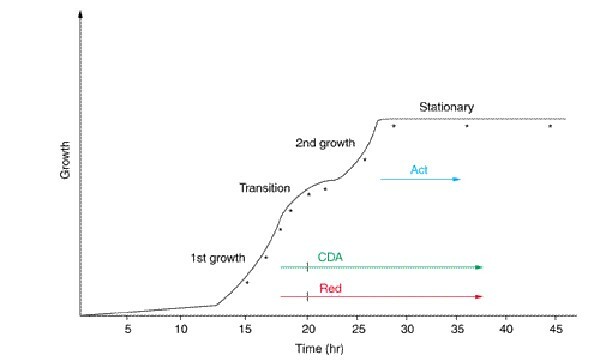 The production of the antibiotics CDA and Red starts during the transition phase, whereas Act production is only apparent during the stationary phase. RNAisolated at different times during growth (see asterisks in Figure 1) was hybridized with 4,960 known genes or putative open reading frames (ORFs) on microarray glass slides. Almost 25% of the genes tested showed a two-fold or greater change in expression between at least two time points during growth. Most known genes involved in antibiotic synthesis were upregulated during morphological transition. Expression of the red and cda genes, involved in the synthesis of Red and CDA, respectively, was upregulated as soon as these antibiotics appeared in the medium. Interestingly, redZ, a putative initiator of the Red synthetic pathway, was expressed slightly earlier. Similarly, the act genes, responsible for the synthesis of Act, were only expressed during the stationary phase, when Act is produced. Comparison of expression patterns of unknown genes with those of known genes suggested the involvement of additional genes in, for example, Red synthesis. Gene expression was also studied in S. coelicolor mutants of redD and/or actII-ORF4, genes involved in the synthesis of Red and Act, respectively, in order to discover other genes whose expression could be regulated by the presence of redD and/or actII-ORF4. The expression of six other ORFs, with dispersed locations, was coordinated by act gene expression and they were named ecaA-ecaE. Their involvement in Act synthesis still needs to be demonstrated. Similarly, genes whose expression was coordinated with red genes were identified and named ecr genes. Some of these were located distant from red locus genes. Interestingly, transcription of redD-independent and -dependent genes of the red locus was enhanced in an actII-ORF4 mutant. Supplementary data to Genes and Development 15:3183-3192 is freely available. Recent information about the entire 8.67 Mb genome sequence of S. coelicolor A3(2), as well as more general information about this soil bacterium, can be consulted at the The Sanger Institute: S. Coelicolor genome project website. The existence of the entire genome sequence and the ability to carry out global DNA microarray analyses enabled study of the expression of functionally related genes present within loci known to be involved in antibiotic synthesis in S. coelicolor, as well as the discovery of new genes that are distantly located but show coordinated expression. This study is a major contribution to our understanding of the gene regulation required for antibiotic synthesis in S. coelicolor A3(2) and its results could only have been obtained by a global gene-expression analysis. A major discovery are the sets of genes whose expression is coordinated with that of genes known to be involved in Red or Act synthesis. This hints at possible involvement of these new genes in the synthesis of Red or Act, or of other compounds whose production might be controlled by similar mechanism(s). To pinpoint their precise biological role(s) and to find possible applications, construction of mutants will be required to perform further basic molecular genetic studies.